Every startup fundraising process is influenced by the balance of power between the founder and the investor. When the founder has a company that is doing incredibly well, and is being chased by lots of investors, the founder has more leverage. When the founder is inexperienced, or has a company that hasn't yet gotten a lot of traction, the investor has more leverage. Often, the output of this shifting balance is reflected in the price agreed to by the two sides. It tends to be higher relative to progress when the founder is stronger, and lower when the investor is stronger. When the two sides are equally experienced, the negotiation is usually “fair” in that both sides know what they are agreeing to. Whether or not they are happy with that is another question. There are, however, situations that arise in which investors take advantage of inexperienced founders and get them to sign terms that are potentially harmful to the company. Investors that do this want more economic upside and know that they can exploit the founder without the founder even knowing what's happening. While I've seen a number of examples of this, there's one I saw recently that was particularly bad. An investor got a first time founder to give them a Right of First Refusal (ROFR) for 2.5x their initial investment on any fundraising that that founder subsequently raised prior to an equity financing round. There are a number of bad things there, but the part that makes this even worse is that the investor has 60 days to say yes or no to the ROFR, no matter what the company does. Imagine the company were to raise $50k on a 4mm cap safe today, and then 500k on an 8mm cap safe in 55 days - which can be a very long time in the life of a startup - the investor could put in 250k at 4mm! This means that the founders of the company cannot adequately plan out their allocations to new investors, figure out how much dilution they'd be taking, or even know how much money they'd raised until 60 days after the last financing. This kind of uncertainty is terrible for founders and for companies. It is a major distraction and complication at a time when the founder really needs to focus and know what's going on. This isn't just true about early stage rounds. Founders who are really successful at early stages may find themselves raising late stage rounds where they are again inexperienced. This can lead to founders signing terms that seem good or inconsequential at signing, but lead to really bad things down the road. For instance, a number of founders agreed to ratchets as a trade off against higher valuations in late stage rounds. This is fine if everything goes better than planned, but can hurt the company, founders, and earlier shareholders if things don't go as well as hoped. Anti-dilution - where an investor maintains their ownership through subsequent financing without having to invest more. Asking for extra advisory shares on top of an investment. This is actually something you might give to incredibly helpful investors who don't have the cash to invest as much as they'd like. It should be your option, though, not a demand. Read every word of every financing that you sign. Make sure you understand each clause, and what that clause will do in the future in different scenarios. If there's anything a doc that you don't understand, don't sign the doc until you do understand those things. Get a lawyer that understands startups. It's important to find someone with experience. Not only can a good lawyer explain what's going on with terms of your agreement, he/she can tell you if those terms are standard. Lawyers can also help you negotiate, though this is usually more relevant in priced rounds. Be really careful of side letters. If you're using a standard doc, like the YC safe, it's probably already well balanced and understood. When an investor wants a side letter, they want something non-standard. This isn't necessarily bad, but it should make you extra cautious. Get help from more experienced founders, particularly ones that have seen multiple financings. They'll be able to give you perspective on what makes sense and what you should push on. They may also be able to help you negotiate. Know that, ultimately, if you are desperate for financing, you may have to accept bad terms. While that's suboptimal, it is ok if you understand what you are agreeing to. It's rare that a single bad term you understand will kill your company, though the aggregate impact of terms you don't understand can materially change your outcome. While these steps can help with future fundraising, there are many founders who have already agreed to bad terms (either through necessity or ignorance), and aren't sure what to do about it. This is tough, because it will depend on whether or not the investor inserted the bad term knowing it was bad for the company, or if they thought it wasn't so bad. As a founder, you should find out, and try to remove it. There's no perfect way to do this, but the first step is to ask the investor to get rid of the term. Say that you were talking to your lawyer or friend and that they pointed out that you signed a term you didn't understand. Ask the investor if you can remove it so that you don't have to worry about it. This will get rid of some portion of these bad terms. If the investor refuses, your options are more limited. If you have a strong network of other investors or advisers, you can ask them to pressure the investor to change. We've done this a number of times for our companies at YC. Remember that startups, and investing in them, is a long term bet. Reputation matters and smart investors - whether or not they are “good” - will know that screwing a company will end up hurting them down the road. You can make clear that you'll let other founders know about the bad terms you signed. An investor can probably sustain this happening once, but if that investor acted badly towards you, they've likely done it to a lot of companies. If many companies start talking about how bad that investor is, the investor will cease to be able to invest in companies and will have to find a new profession. The investors that force these terms on unsuspecting founders fail to realize that the big outcomes in investing don't come from clever terms, they come from outliers. Even more than that, asking for these terms is a direct signal that the investors isn't a good investor. I'd avoid those investors asking for these terms, and I tell founders to do the same. In fact, inserting bad terms into funding documents is a good way to limit the number of chances investors have to invest in those black swans because adding those terms will destroy their reputations - it's just a question of how long it will take. This will probably only work for early stage rounds and investors. Later stage investors are more hard nosed, and will hew tightly to caveat emptor. Thanks Geoff Ralston, Andy Weissman, Dalton Caldwell, and David Tisch for your help on this. I think that it is nearly impossible to figure out the exact changes that new technologies will create in the world. That's problematic because investing in startups is largely about figuring out whether or not a team with a new technology - or application of existing technology - will create a change large enough to support a big new company. Not only is it hard to figure out what changes will happen, it's hard to figure out what changes will happen over given periods of time and if those changes are good or bad. In fact, it's probably safe to assume that any given technology will create badness over certain periods of time even if the long term impact is highly positive. Computers are a good example of this. During WWII, IBM punch card machines (not quite computers, but getting there) were used by the Nazis to organize aspects of the Holocaust. At the same time, Alan Turing was building the foundation of modern computing to crack Enigma. Internal combustion engines gave us mobility and trade on a previously unimagined scale, but also led to anthropogenic climate change. Since there's no way to know every change that a piece of technology will produce, I think there are two ways of evaluating what to build and invest in. I think of these as Utopia Bets and Apocalypse Bets. The most extreme example of this dynamic comes from AI. In one framing, AI creates a world in which all of our hard problems are solved and humanity devotes itself to exploration, art, and generally being good. In the other extreme, the AI wipes us out. I've found that many people like to talk about their Apocalypse Bets. There is something emotionally satisfying about being cynical and painting a dark version of the future. I think one of the reasons people do this is because they don't want to look stupid and they want to hedge against bad outcomes. If you predict something will go well, and it doesn't, not only does a bad thing happen, but, worse, you are humiliated for being wrong! If you predict something will go badly, and it does, at least you were right. If it goes well, your life is better, and everyone forgets about you being wrong. Certainly, Apocalypse Bets are popular in the public imagination and press these days, as you can see by looking at books and movies where technology gets away from man and destroys us. Turning on the news or reading the paper, you can find any number of talking heads discussing why our love of technology gave us unstoppable pollution, weapons we can't control, and epidemics ready to wipe out half of humanity. Add into this that whenever the market starts going down or volatility picks up, talk about how much worse everything is going to get becomes more common because people are scared. There are investors that have made a lot of money off betting that things will get much worse, mostly in the form of shorting the market in one way or the other. No matter what the talking points are, though, I've never actually met someone who makes venture investments in Apocalypse Bets, regardless of how bearish they are about everything else. I think this is because capitalism is a bet on the future. Investing over the long run has a positive expected return because markets believe, overall, that the economy will grow. If you didn't believe this, you'd never invest. If that's true, then I think venture investing is an exercise in optimism. The whole process of betting on future return is magnified by startups. In startups, the founders and the investors are betting that a small number of people can change the way the world works, and make a lot of money in the process. It seems that most of the changes that founders are trying to create improve the world. I can't think of ever hearing a pitch where the founders argued that the world getting worse would be a net positive for their business. This might be an argument made by arms manufacturers, but I don't know as I've never been pitched by one. Startups, then, are making Utopia Bets. It is rare to find a founder who argues that their company will, by itself, bring about Utopia, but they mostly believe that the aggregate force of technological change is pushing humanity to a much better place. This makes sense, seeing as how spending your life working towards making the world a worse place would be depressing for anyone that isn't a supervillain. The best investors I know look for Utopia Bets as the direct rationale for investing in a given company. Investors rarely pick a specific solutions which they think will bring about a better future and then finding a company to do that thing. Instead, they'll often start with a question similar to: “In the future, cities will have 40mm people. What needs to be built to make those cities function well?” This leads to branches of sub-questions and hypotheses. The investor would probably need to think about transportation, communications, logistics, etc. Each of those areas gives rise to a potential set of companies, towards which those investors will be receptive. This thought process can be useful to investors in two ways. On one side, having a distinct view of how the future will be better gives investors a way to publicly talk about what interests them. If they say intelligent things, founders who are thinking about the same ideas will reach out to talk about those problems. Some of those founders will be really good, and may end up building companies which the investors can put money into. There are also many people who have thought deeply about these problems, but didn't think anyone would fund the crazy ideas they had to bring about a better world. When those people come out of the woodwork and build companies, not only would the investor likely the first opportunity to invest, but, even if the investor passed, there's a net good of new interesting ideas being tried in the real world. The other good thing that happens through this thought process is trickier. Thinking deeply about certain problems can be a really helpful filter when deciding to invest in ideas, but it can also be misleading. On the one hand, thinking deeply about a given set of ideas can help differentiate what is good and what is bad. Conversely, it can also create significant bias towards funding ideas that seem like a perfect Utopia Bet, without considering the founders. From this perspective, any bet is great if it stands even a tiny chance of making the world better. That usually leads to funding companies that only seem good. It's much better to consider whether or not the founders are actually good and likely to build the company that will help make the Utopia Bet come true. You can get a read on this by working through how deeply those founders have thought through the idea as it relates to the way the world is going to change. In fact, the best Utopia Bets are about the founders and their views on how the world will change, rather than the a priori assumptions of the investor. These a priori assumptions can actually end up creating throwing false negatives, because the best companies often exploit something in the market that outside experts have dismissed as non-viable. This fits well with the idea that the best founders should know far more about what they're making, and be far more passionate about it, and be thinking far more originally about it, than anyone else. These founders should continually upend how the investor thinks and the investor should be learning more from the founder than vice versa. If an investor actually knows more about the idea, and is so passionate about it, that investor should build the company! Founders who find investors whose view of the future echo - but doesn't mirror - their own end up in a relationship that is far more collaborative than those who take money from investors motivated only by returns. When looking for investors, it's important for founders to understand what sort of Utopia Bets individual investors want to make, because it will help frame the conversation and create a real dialogue in which both sides learn. That's a far more effective route to raising money than one sided pitching. This isn't to say that the relationships formed through this process will always be smooth. In fact, when two people with strongly held visions of the future get together, every difference in that vision can lead to conflict. However if both sides are truly pulling for making the future better, they should be able to find a way forward together to build incredible things. John Paulson (https://en.wikipedia.org/wiki/John_Paulson) almost $5B off of one set of linked bets against the rising housing market. George Soros “broke the pound” in 1992: http://www.investopedia.com/ask/answers/08/george-soros-bank-of-england.asp. That felt like an apocalyptic bet, but it also may have helped UK break a recession. He also then bet on the Pound and made more money! (thanks for the info, Elad!) I see these bets as different than shorting a company because of their basis on big macro trends. This isn't true of short term trades where investors are often betting against temporary pricing imperfections. That reflects a different kind of optimism - confidence that you are smarter than markets. Though I've met one or two. They're either crazy, working on AI, or both. Bill Gates talks about this quite a bit, and links it back to his and Paul Allen's original vision for computers: https://www.gatesnotes.com/2015-annual-letter?page=1&lang=en. We've actually noticed both of these trends in response to our Requests for Startups https://www.ycombinator.com/rfs/. Thanks to Andy Weissman and Elad Gil for helping me think about this. While thinking about wiggles (Ignoring the Wiggles ), I looked at when the biggest tech cos in the world started relative to NASDAQ. At first, I thought I'd find no correlation between how well the index was doing and when successful companies were founded. I love looking at this in chart form, which shows just how many market moves these companies have weathered as they've grown. I was actually surprised to discover that most of the companies on my list were founded while the market was doing relatively well on a trailing 1, 3, and 12 month bases. 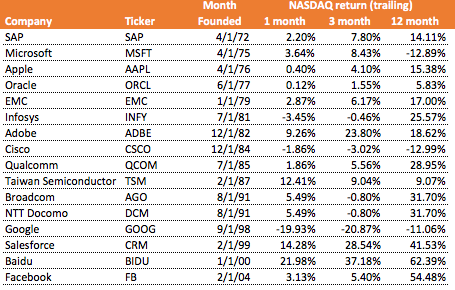 Of course, if the founders of Microsoft, Google, and Cisco had looked at the returns of the NASDAQ in the year leading up their decisions to start their companies, we wouldn't have three of the most successful companies in history. I'm glad they didn't stare at the market wiggles. There's also an important lesson in here for me as an investor. It's easy to get excited about startups when startups are doing well and when the economy is roaring. It's harder to be as excited when public markets are down and I'm seeing flat and down rounds. The easy sounding lesson to draw is usually along the lines of being aggressive when others are fearful, and conservative when others are aggressive. But I don't actually think that's right, I think the right answer is to ignore everything else and judge founders and their companies on their fundamentals. That seems clean and easy in principle, but is difficult to put into practice because one of the things investors do is make a bet on the paths of markets over time. When markets seem to be saying bad things about the future, and market pricing is a bet on the future, it can be tough to ignore them or bet explicitly against them. If markets are exuberant, it's almost as difficult to be confident that you're paying an appropriately high price or investing in an actual good company. It takes time to form that confidence on the basis of fact rather than just guessing and justifying it later. I'm still working on that. Data is from http://www.macrotrends.net/. Scale is log. Startups that do well often follow a set of common principles. These principles influence how they develop products, build teams, raise money, and get customers. The most successful startups, though, are exceptional and often seem to go against these principles in various ways. For founders looking to learn from the experiences and paths of other startups, this can cause confusion and lead to bad decisions. I think this happens because of how hard it is for outside observers to understand the full context of why given decisions are made in other organizations. It is also nearly impossible to separate causation and correlation, even with perfect understanding of the rationale behind a decision. I've spoken with many founders who point to outcomes at other companies as justification for decisions that they are making with their own companies. These founders rarely give enough weight to to factors like timing, luck, and the impact of particularly skilled employees or founders in producing those outcomes. That creates a paradox. One of the best ways to learn how to succeed is to follow good examples set by others. At the same time, following those examples can often lead to very bad decisions that harm companies. Figuring out which examples to follow, and how to follow them seems hard. There is, however, a clear framework for figuring out what to do. First, don't do anything just because you see someone else doing it. For instance, there are many successful jerks, but that doesn't mean you should be a jerk. Some companies succeed while spending huge amounts of money, but you should probably spend as little money as possible to achieve your goals. Second, when you see a successful company doing things that appear to break from sound principles, look at those examples through the lens of your own company and circumstance. If you take the set of things that exceptional companies do, and overlay it on the set of things that make sense for your business and team, you'll end up with the set of things you can learn from exceptional companies and mimic. You can do this even without perfect knowledge of causation, because simply knowing that something is possible is often enough, given the right people, to achieve it. You can also look at your existing practices and plans to discover whether or not you have to change them. First is to look at the decisions you are making at your company and ask whether or not you've derived them from the logic of your own business, or if you're doing them only because you saw a successful company do something similar. If it's the latter, you then have to figure out if those decisions make sense in the context of your business without the benefit of outside examples. This is especially hard to do because you can't use your own exceptionalism as a reason for doing something. People and companies aren't exceptional because they say they are. They are exceptional because evidence shows them to be so. What's really happening when you run this exercise is that you're deriving decisions for your company from first principles. Things other companies do may provide some ideas, but the best decisions come from focusing on what will help your company succeed on its own terms. As your company grows, you may realize that many of the things you do don't line up with the principles you initially thought would govern your company. That's a good thing, because it means that you've figured out the pieces of your business that are exceptional. While you can't copy exceptionalism, proof that it is possible is everywhere. You can use examples of that proof to help make decisions, but ultimately, you'll have to create it yourself. And if you can create it, you have a good shot at building a great startup. Thanks, Geoff Ralston, for your help writing this.